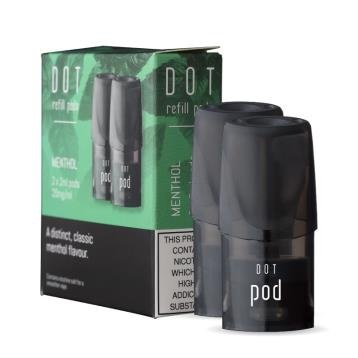 The DOT Pod range features nicotine salt e-liquids in 2ml pods and 20mg/ml strength. They are available in four flavours and are for use with the DOT Vape Kit. Nicotine salt creates a smoother vape for the higher strength of e-liquid in DOT. The DOT Pods feature the new FEELM technology. FEELM is unlike a traditional coil, instead featuring a special ceramic cube with an integrated flat metal film. When heated, the increased surface area of the film delivers an accurate and consistent vape, giving you a satisfying experience.